Izakaya is not a noisy place full of drunk people. 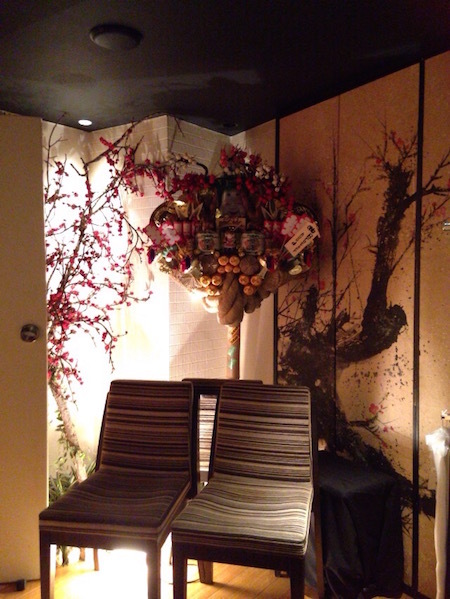 Umesaku-yoru is a very fancy type of Izakaya which has wide range of Plum wine and delicious food. Tables are sorted for couples, family, friends form 4 to 6 floors. 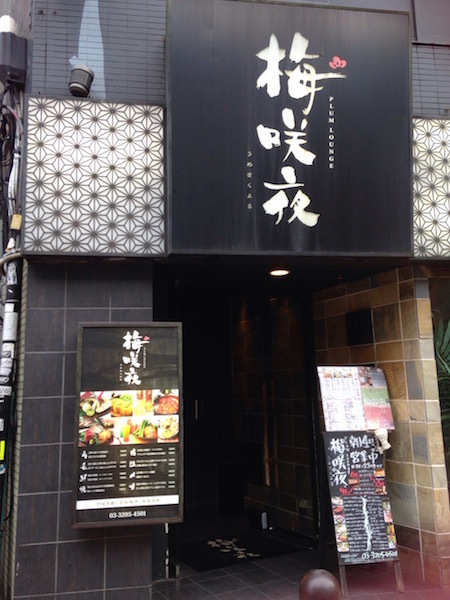 Japanese dining restaurant, Umesaku-yoru locates between Shinjuku Kabukicho and Shin-okubo. Going up to 5th floor by an elevator, the fancy entrance welcomes you! There is a huge rake by side. Jazz was playing inside which creates a tasty atmosphere. This restaurant owns 4th, 5th and 6th floor, and sorting the layout of tables for group, family and couple. 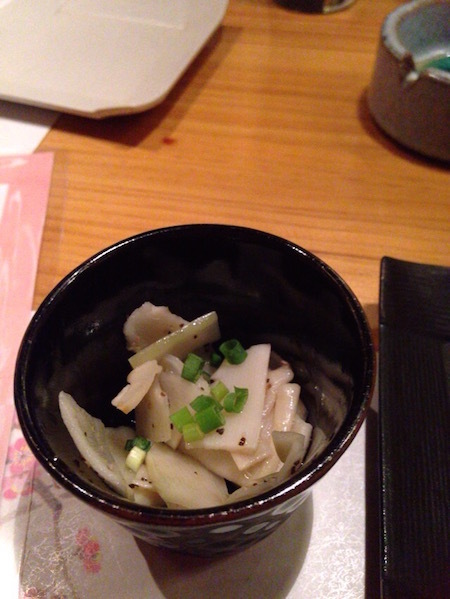 Today’s appetizer is lightly seasoned bamboo shoot, tastes like Szechuan pickles. The sour taste will definitely goes well with beer! 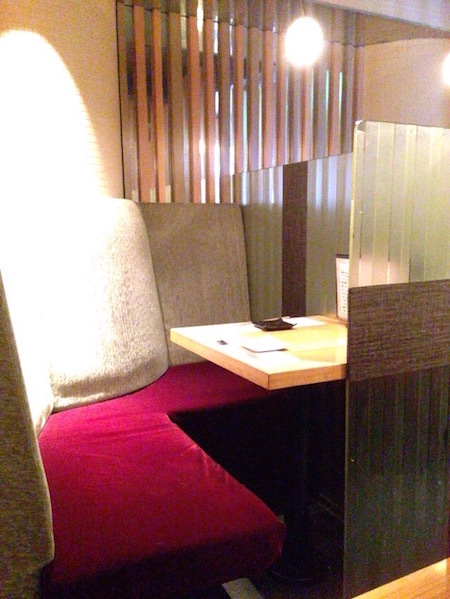 This private seat is so comfy and makes me feel at home. You can enjoy chatting in your pace. 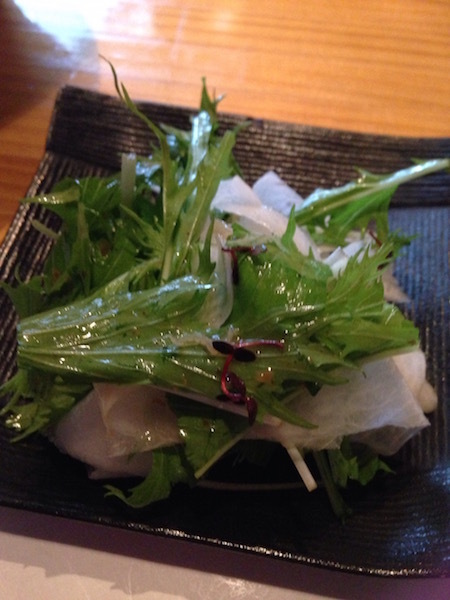 Let’s start with “Ume-jako salad”, salad with small fish seasoned with plum. The crispy texture of white daikon radish and savory small fish went so well each other. Everyone would enjoy this dish for sure. 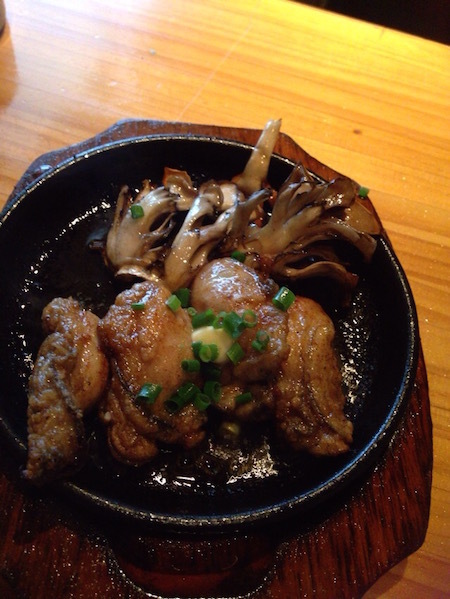 The next dish is… butter grilled oysters and maitake-mushrooms. The sound of sizzling on a small pan made me so excited to have them! The seasoning is light flavored soy souse to set original ingredients off. The smell of bunt butter is amazing too. A couple sitting next table of us ordered the same dish. Probably they wondered where the amazing smell comes from! Apparently, people cannot deny ordering if they smelled this dish! 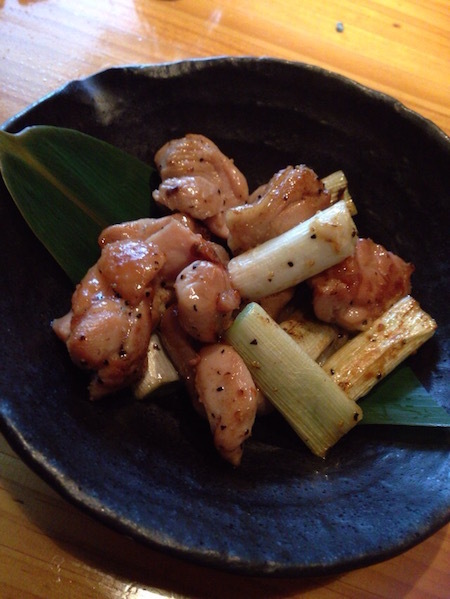 While we were enjoying chatting, grilled chicken and spring onions seasoned with black pepper has arrived. This dish got sweet soy seasoned and didn’t have punchy taste, but they were really good! Master must be considered a lot about the natural flavor of ingredients to season. We were ordering “imo-jouchu”, distilled liquor made by sweet potato from the beginning. 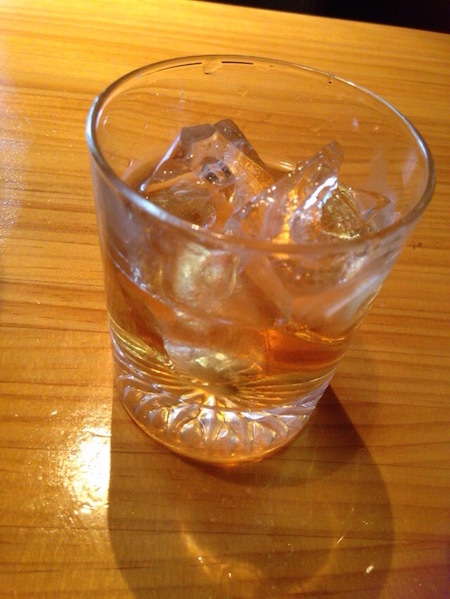 But let’s try “ume-shu”, plum wine, since this restaurant has wide variety of plum wine, which is quite rare in Tokyo. Refreshing and pleasant after taste of this plum wine will be loved by people who doesn’t like sweet taste of wine. 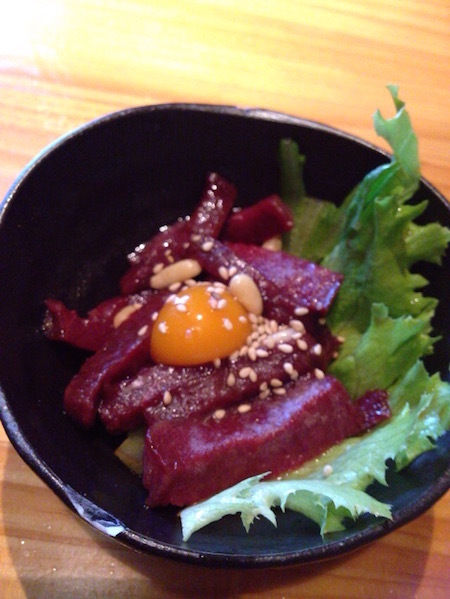 Hose meat sashimi of Yukhoe (Korean dish of seasoned raw beef topped with an egg yolk). Please try to mix roughly cut hose meat and egg yolk. There is no ordor smell of hose meat at all, and it goes well with drinks too! 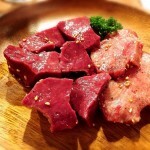 Hose meat is considered to be healthy meat since they don’t contain much fat. We were so into talk about how diet is hard…. 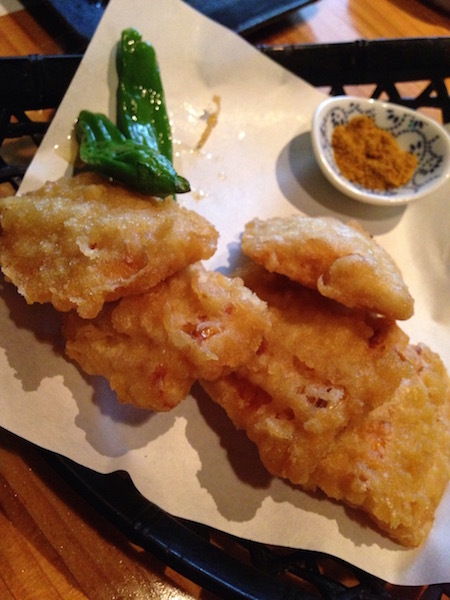 We also ordered my friend’s favorite, sweet corn tempura! This was my first time to have it, and it was delicious! The sweetness of just-fried corn has perfect harmony with chili curry powder. We haven’t had fish today! Let’s order grilled fish! There you go. 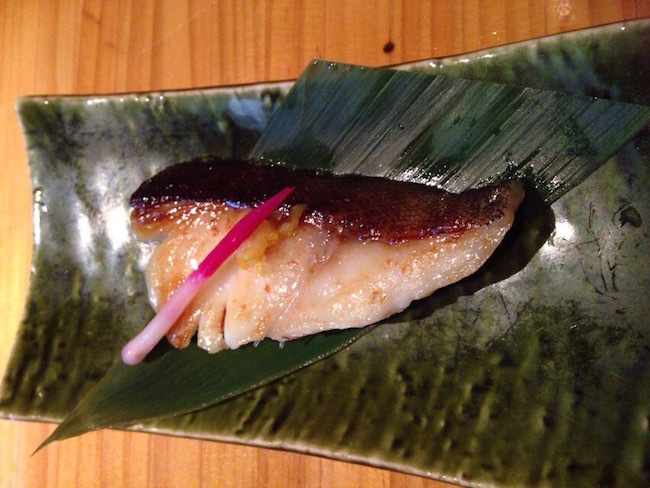 Our awaited “miso-baked sablefish. It has good quality of fat on, and it break easily with chopsticks! A few minutes later.. It’s all gone from the plate and into our stomach! This miso-baked sablefish is must-try dish at Umesakuyoru. We were already full and satisfied with great meals…but the last order to have “recommended dish of the master”. 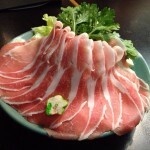 Hitsuma-bushi is a famous Japanese dish. Any seafood ingredients topped on rice and pour “dashi (seasoned soup)” or green tea” from the top. 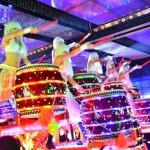 Usually, people have Hitsuma-bushi with an eel. 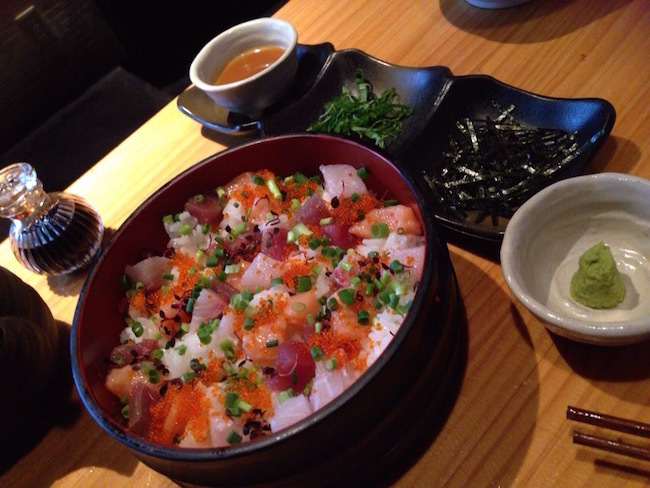 But this time, there were heaps of Sashimi on the top instead of eel. I started with wasabi and soy souse, and adding green tea. It’s such a luxurious time to taste variety of seafood too. It was such an enjoyable time o have good food in a relaxing place. 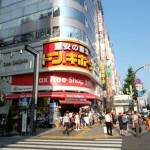 “Lahaina noon” is a Hawaiian restaurant in the Shinjuku Kabuki Cho area. 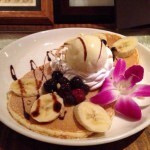 The thin pancake absorbs all the syrup and has a nice rich taste with a soft texture. NO MEAT, NO LIFE. 2nd.